ASP.NET - How to integrate CI/CD with Visual Studio Team Services? Home » ASP.NET » How to integrate CI/CD with Visual Studio Team Services? How to integrate CI/CD with Visual Studio Team Services? Microsoft provides free Visual Studio Team Services for small team. It has free unlimited Git repositories and 4 hours per month to run builds, which should be more than enough for my projects. I already integrated karpach.com front end and admin site. In this post I'll document how I integrated redboxnewreleases.com. My favorite browser is Google Chrome, but for below process I used Microsoft Edge, since some things didn't work in Google Chrome (e.g. 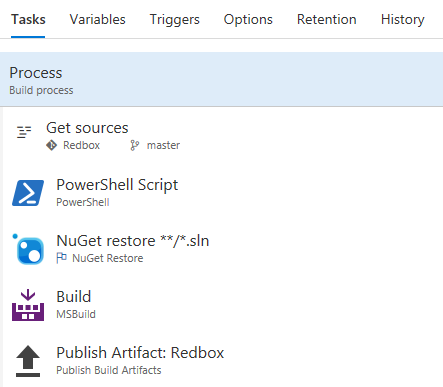 reordering of build tasks). In my previous CI system I used ExtensionPack for assembly version modification. This is old approach, so I just removed that task reference and used different approach to specify version later in the post. Set repository setting to build on any master branch change. Went to options tab and set "Default agent queue": Hosted VS2017. Deleted "$Env:TF_BUILD -and -not" from that powershell script. Replaced TF_BUILD with just BUILD in ApplyVersionToAssemblies.ps1. Added ApplyVersionToAssemblies.ps1 to Git repository. Went back to build definition web editor, switched to Variables tab. Added MajorVersion and MinorVersion variables there. Switched to the Options tab and filled "Build number format" field with $(BuildDefinitionName)_$(MajorVersion).$(MinorVersion).$(Year:yy)$(DayOfYear)$(Rev:.rr)). Made sure that AssemblyVersion and AssemblyFileVersion lines present in AssemblyInfo files (powershell script does replacement in those files). Added powershell task to run ApplyVersionToAssemblies.ps1. Moved up powershell task to run after Get sources task. Picked my build from previous step. Added a deployment group phase task. 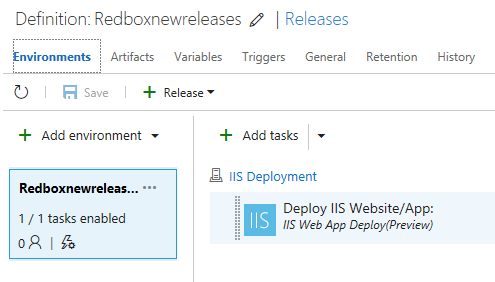 Added "IIS Web App Deploy (Preview)" task. Ran generated powershell script on my VPS hosting server. Specified package folder using browse button to point to package.zip: $(System.DefaultWorkingDirectory)/Redbox-CI/Redbox/package.zip). Set trigger for continuous deployment.